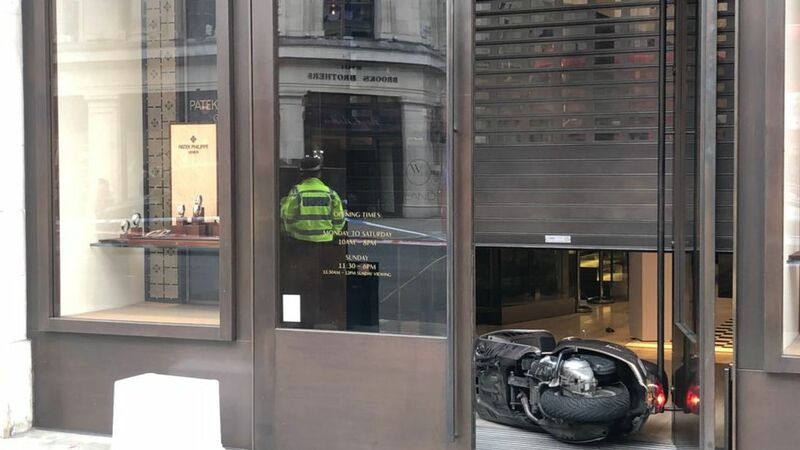 A moped gang of robbers wielding knives and hammers has raided a jewellery store in central London. Police were called to the Watches of Switzerland store in Regent Street, central London, just before 10.20am. Photographs of the scene show one scooter seemingly abandoned in the street and another inside the doorway of the store, and a large knife was also pictured on the pavement. The Met Police said they received reports that a number of suspects armed with knives and hammers had entered the store. A spokesman for the force said "several items of property" were stolen but did not give any more details. It was reported that members of the public managed to tackle one or more of the suspects to the ground. One man was arrested at the scene and taken to a central London police station. Footage shows a group standing next to several mopeds around the shop with traffic and pedestrians nearby. Just one suspect, wearing a fluorescent jacket, slips into the store. One member of the group rams the store door with a bike. The raid left a scene of destruction, with displays of silver and jewelled watches stripped completely bare. Hammers can be seen littered on the floor of the shop, which filled with smoke during the raid. Police have appealed to anyone with information about the incident to contact them on 101, quoting CAD 2179/05JUN. It is the second time the store has been targeted in the past few months, with a raid in March which saw a moped gang using sledgehammers to smash their way into the store. Other jewellery stores have also been targeted, with Mappin & Webb, also in Regent Street, and Boodles of Chelsea both hit in 2017.